Tottenham defender Kieran Trippier hopes returning to the England squad can kick-start a "frustrating" season. Trippier, 28, impressed for England at last summer's World Cup but has failed to replicate that form for Spurs. 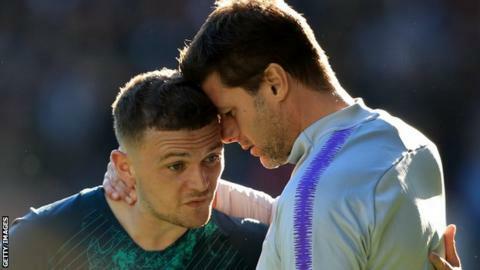 "This season I have not done as well as I could have done," Trippier told a BBC Radio 5 Live Sport special to be broadcast on Wednesday from 19:00 GMT. "That's why I'm happy to be back with the England team and, hopefully, I can do well for the rest of the season." Trippier played in England's 3-2 Nations League win over Spain in October but withdrew from games against the United States and Croatia in November because of a groin injury. Despite concerns over his form, he has been picked by England manager Gareth Southgate for Euro 2020 qualifiers against the Czech Republic and Montenegro. England host the Czechs on Friday before an away tie in Montenegro on Monday. "The first half [of the season] has been frustrating for me and I can do so much better," added Trippier. "It's just one of those things that I take as a player and I can only learn from it." Trippier has made 29 appearances for Tottenham this season and says Spurs boss Mauricio Pochettino has been helping him get back to his best. "He is a good manager," said Trippier. "He pulls you into his office and he brings clips up [from] 12-14 months ago up until now and he just explains what I was doing right then and what I am doing wrong now."